Where do children go after Montessori Preschool? Our students do well in elementary school. Our students typically transition into Gifted and Talented programs and others skip grades. Many alumni successfully compete to earn admission to private schools across Houston, including Kinkaid, The Village School, the British School, and nearby religious and charter schools. Potty-training is parent-initiated, teacher-supported. The school is happy to support potty training process for children in the Toddler community. Children in the Children’s House and Kindergarten programs must be fully potty trained, so they can take advantage of our learning opportunities. Fully potty-trained means a child is independent in the restroom and knows (1) when to use the toilet (2) how to remove their clothing without accidents (3) how to sit comfortably on the toilet (4) how to wipe themselves, flush, and wash their hands without aid. We recommend children complete potty training by age 3 (or earlier). What age should my child start Montessori school? Depending on the campus, children start at 6 weeks or 18 months. 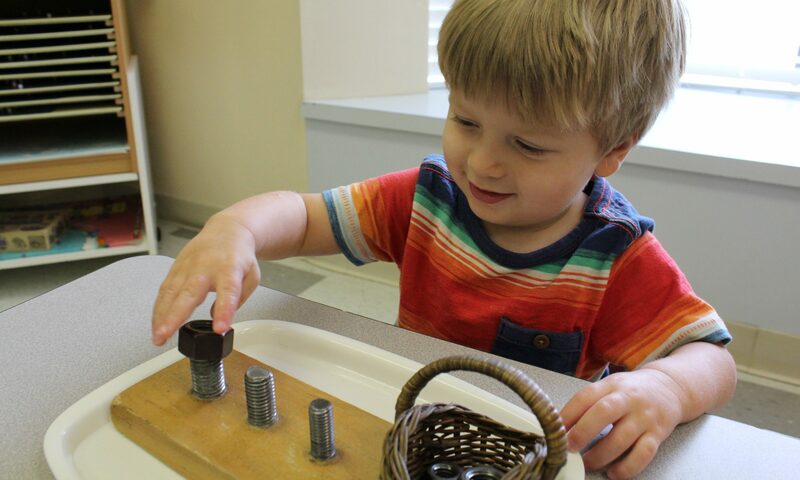 We highly recommend children start a Montessori school by age 3. Our programs serve students ages 6 weeks to 6 years. Nope! We serve nutritious snacks twice a day with lemonade or milk. Students also have access to water in the classroom. Parents are welcome to bring their own snacks, which we can serve as snack time, and a separate water vessel, labeled with the child’s name. Our Montessori Guides are happy to show children where to store and access their water during the day. What age will my child start to write and read? Every child is different. At our school, most children start to read by age 3 ½. How do children transfer from a Montessori environment into traditional public school? Children in a Montessori program transfer smoothly into traditional public school. Some are even ahead of their peers academically, socially, and emotionally. What time does your school open? Our hours are 6:30 AM to 6:30 PM. Yup! We have ample play space outside, with shaded patios and structures. Children can enjoy the outdoors – even on hot or rainy Houston days. Two of our campuses have a beautiful wooden train designed by local southern carpenters. What do your alumni do? We have over 800 Alumni across Texas and around the world. From a 12-time published author to a Biomedical Engineering major at Rice University, we’re very proud of our alumni and their good work. Yes, we have an array of extracurriculars for ages 2 to 6 years. Contact us for our latest schedule. How do parents engage in your school? We believe parent engagement is critical for enhancing the school community. From reading a story to being a Mama Bear (our version of a homeroom mom), we like to work with each parent to find the right level of engagement.